Ted Cruz rises in national poll: Much was made of the mini war of words between Ted Cruz and Donald Trump this week, but the Cruz strategy on Trump has been simple: make nice. National Republican strategist Katon Dawson join to discuss. Can Rahm Emanuel hold on to power? U.S. Attorney General Loretta Lynch announced that the Justice Department is opening a civil rights probe of Chicago's police department. Alderman Carlos Ramirez-Rosa, Dorian Warren, Susan Del Percio and Joy-Ann Reid join to discuss. 'Orange is The New Black' author 'optimistic' about reform: While at the Summit at Sea, Piper Kerman, author of "Orange is the New Black," talks to MSNBC's Dorian Warren about what she learned about prison and the criminal justice system -- and how it needs to change. Summit at Sea 2015 brought together 2,500 passionate change-makers on an immersive three-day voyage. There’s still hope for Earth’s oceans: Aquanaut and National Geographic's explorer-in-residence Sylvia Earle joins MSNBC's Dorian Warren to discuss "hope spots" and how we can still prevent oceans from being destroyed. 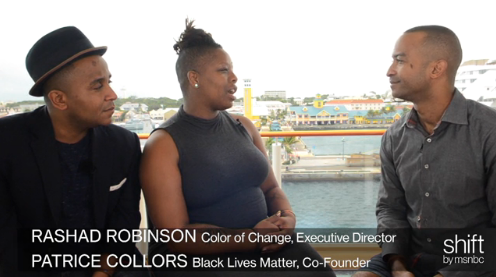 Black Lives Matter co-founder Patrice Cullors and ColorOfChange’s Rashad Robinson join MSNBC for an interview following their Summit At Sea panel. They illustrate the importance of fighting for equal justice and ponder on the future of the Black Lives Matter movement. Why are we prone to infidelity? In this exclusive interview at Summit at Sea, renowned relationship therapist Esther Perel unpacks the dissonance between our human want for stability and novelty, and what that says about society. The trial is set to begin in Baltimore for the first of six officers charged in the death of Freddie Gray, with a jury selection scheduled for Monday. Seema Iyer, Dorian Warren and Raul Reyes join to discuss. As the Republican field takes shape, Texas Senator Ted Cruz is looking more like a real contender, with the poll numbers and the money to go the distance. Dorian Warren, Raul Reyes, Susan Del Percio and Zephyr Teachout join to discuss. Check out a behind the scenes look at the Democratic Presidential Forum hosted by Rachel Maddow from Friday night with Dorian Warren, the host of the Shift’s "Nerding Out" and msnbc.com digital producer Mary-Margaret Cimino. As unemployment continues to decline, wage growth remains stagnant. Dorian Warren, Bryce Covert and Kevin Hassett join to discuss. Are Uber drivers employees of the company or independent contractors? Attorney Shannon Liss-Riordan joins to discuss the lawsuit brought against the company by three drivers. The biggest NFL pre-season buzz isn't necessarily about the action on the field, but a new movie starring Will Smith titled "Concussion". Dorian Warren, Dr. Anthony Lessi, Harry Carson and Demaurice Smith join to discuss the head injury issue within the NFL. A Nerding Out panel talks about the purpose of the speech for presidents, and whether Obama met his goals on Tuesday night. A Nerding Out panel talks about the beginnings of the State of the Union and its relevance. How has social media changed the SOTU? Nerding Out's Dorian Warren talks to a panel about the state of the Union in the age of social media and a rapidly changing media environment. Prof. Julian Zelizer joins Nerding Out to share highlights from his book, "The Fierce Urgency of Now," which focuses on LBJ and Congress. Prof. Christina Greer talks about why LBJ and President Obama are often compared to each other . Occupy the Faculty Room: Prof. Christina Greer encourages viewers to read "Pudd'nhead Wilson," which sheds an interesting light on slavery and African-Americans. Prof. Julian Zelizer then suggests another read, "Fear Itself," which focuses on The New Deal. Columbia professors Shamus Khan and Suresh Naidu talk about what's new in the world of academia that has top social scientists talking. Alexis Goldstein and Shamus Khan talk about how business cultures change the way policy makers manage the economy. Wall Street professional-turned-activist Alexis Goldstein talks about how Wall Street's bonus season affects the ideology of its employees.